In a small bowl, stir together cream cheese and the 4 teaspoons honey. Spread one side of the bread slices with cream cheese mixture. Top four of the bread slices with strawberries, granola and sunflower kernels. Top with the remaining four bread slices, spread sides down. Coat a waffle maker with cooking spray; heat according to the manufacturer’s directions. 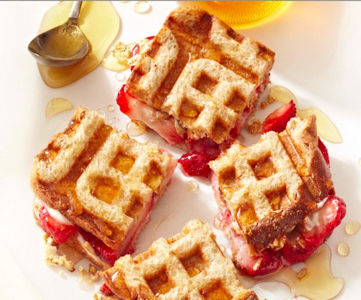 Cook sandwiches, one at a time, in waffle baker about 2 minutes or until golden. When done, use a fork to lift sandwich off grid. Cut sandwiches into halves or quarters. If desired, serve with additional honey.